Business Tianjin Magazine - Magazine ART & LEISURE: To the Opera! ART & LEISURE: To the Opera! 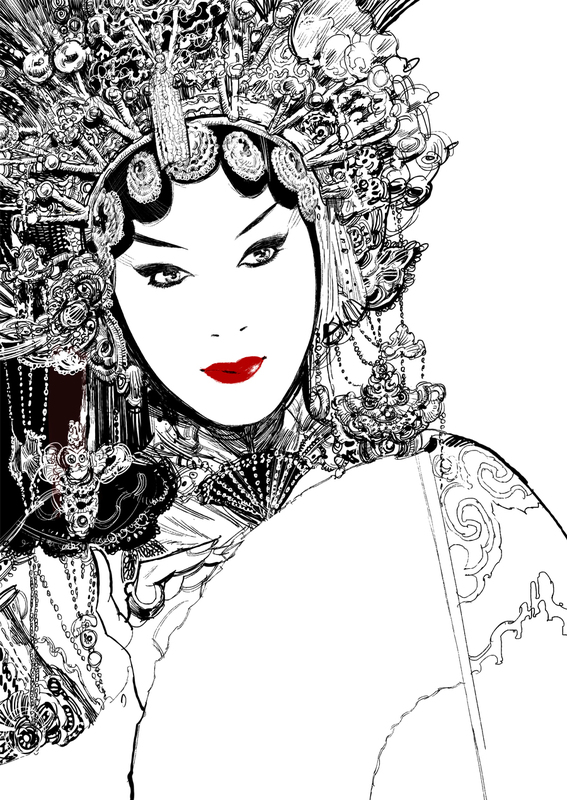 The classical art of Peking or Beijing Opera is, despite its fame, still quite mysterious. Surreal voices, traditional music and spectacular costumes - what more can you from a Chinese cultural getaway? However, sadly, Chinese traditional opera is going through a hard period - it is close to being forgotten by Chinese viewers. In spite of globalization, more and more young people are turning to Western cinemas and watching movies as well as listening to modern music, while the ancient art of Beijing Opera is getting covered with dust. Though, one of the most distinctive Chinese art flow has a plenty to amuse even "seen it all" kind of guests! There is no doubt that one can easily be astonished when listening to Peking Opera for the first time! Singing that doesn't fit the traditional definition of the word is performed by intensifying and changing the tones quite unexpectedly and, therefore, can distantly remind of pheromone sounds. However, Peking Opera also features very rhythmic dialogues and conversations that can be actually understood by Chinese listeners (on the other hand, singing can be understood by no one without a text provided). Some plays can include dancing and martial art which is specially adapted and stylized for Peking Opera. It is easy to imagine that Peking Opera began several centuries ago along with a variety of other traditional art and crafts in China. However, itâs "official" period of formation is middle of the 18th century. In fact, by that time many kind of performing and singing practices caught on in various areas of China and modern Peking Opera is a certain mixture of all of them. 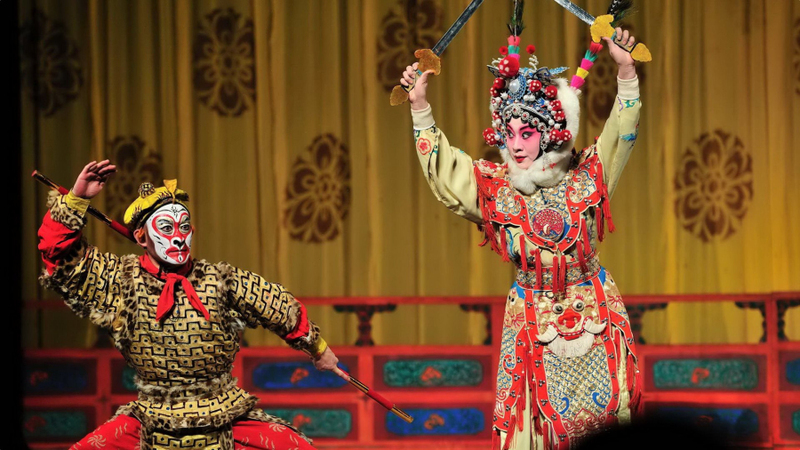 In the 55th year reigned over by the Emperor Qianlong (1790), the most famous four theatrical troupes SanQing Troupe, SiXi Troupe, ChunGong Troupe and Chun Troupe went to Beijing in succession to show their opera performance and then obtained ultimate success. Shortly after, based on 'Anhui Opera', 'Han Opera', absorbed the features of the local folk ditty like the 'Kun Opera', 'Yiyang Opera' and 'Shaanxi Opera' and also mixed with characteristics of Northern dialect, Beijing Opera was formed. Later, Beijing, as well as Tianjin, became a Mecca of Peking Opera where the most spectacular performances, as well as opera schools, take place. Like many operas created in Europe in 18th-19th century, plots of Peking Opera are mostly based on political and military events. Therefore, it is quite common to see history replayed on a stage of Peking Opera; Emperors discussing war tactics with their inner circles, soldiers protecting the country or massive historical events that are shown through the life of commoners. But, less epic stories can also be performed in a traditional manner. One of the very famous operas "陈三两爬堂" (ChÃ©n sān liǎng pÃ¡ tÃ¡ng) tells a moving story about a caring sister that comes to the Governor in the hope of getting a loan for her younger brotherâs education and, instead of it, gets a proposal for working in a brothel to fulfil her hopes. After the long dialogue, when she shames the Governor for his insulting suggestion, he finally understands his mistake. So, plots can be different, but young courageous ladies do get what they have come for! It is a distinctive trait of the Peking Opera to have very strict role division. For Peking Opera goers it is almost impossible to hope for an unexpected curve of the story, as the moment actor appears on the stage, his role and character are pretty clear. 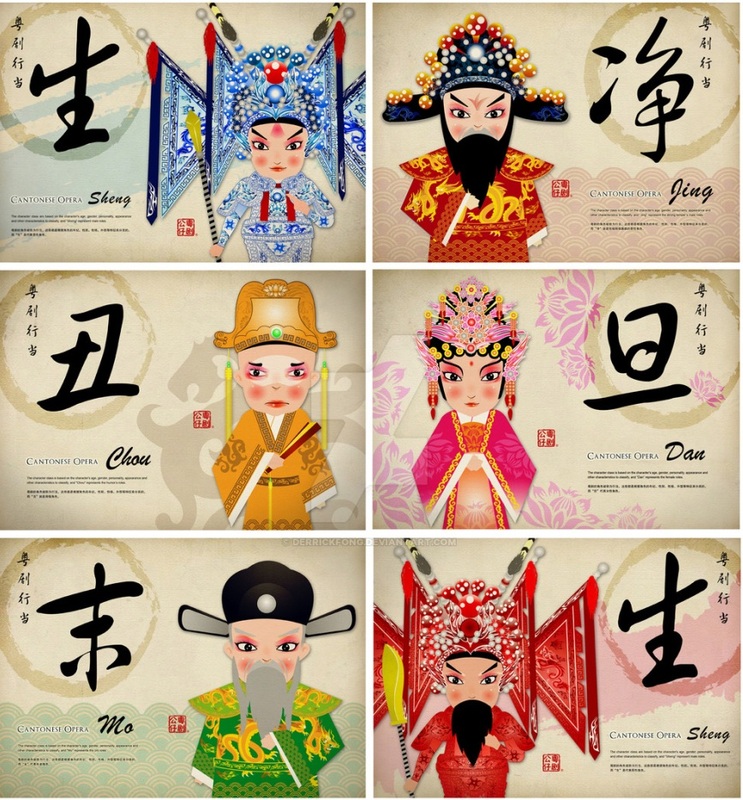 Traditionally there are four main roles - Sheng, Dan, Jing and Chou. 'Sheng' acts the masculine positive role. According to different age, status and character, Sheng can also be divided into three kinds: Laosheng (Old Men), Xiaosheng (Young Men) and Wusheng (Military Men). 'Dan' on the contrary is feminine positive role and is also divided into many kinds: Qingyi (the honorable women in a distinguished gown), Huadan (the innocent and extroverted young lady), Laodan (Old Ladies), etc. 'Jing' acts the supporting role of kind-hearted man. One of the distinguishable traits of "Jing" is fully painted faces, so another name for this role is 'Face-Painted Roleâ. And, finally, to balance the good and the evil in a story, every opera has a 'Chou' - sinister and sly. All of this characters are usually quite easy to discover - each of them wears special costume and accessories as well as has different masks or make-up. Colours are extremely important in all kinds of Chinese crafts and art. And Peking Opera is no different. Each character in a play has its own distinctive make-up that is considered to be a special workmanship among the Chinese. So, doubtlessly, red-faced or having prevailing red elements and characters represent allegiance and bravery. Blue and black - neutral, representing valor and wise personages. However, if there is a white or yellow-faced character on a stage, be advised - it is a disguise of a traitor or a hypocrite. In addition, sometimes plays include mystical figures of gods or demons that usually have golden-painted faces.